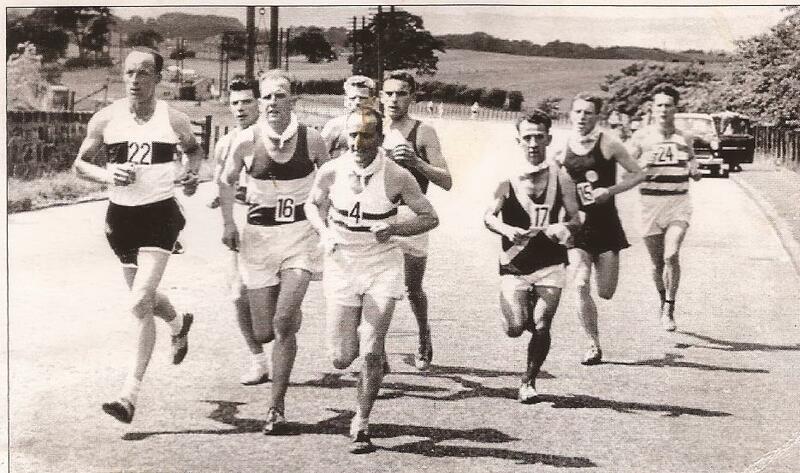 Above: Leaders at the five mile mark of in the 1957 Scottish marathon championship: left to right, George King (22), John Kerr, Andy Fleming (16), Hugo Fox, Hamish Robertson (4), not known, Harry Fenion (17), not known, Ronnie Kane (24). The A.H. Blair Memorial Trophy is a fine piece of silverware which has graced many varied mantelpieces and trophy cabinets since being donated to the Scottish AAA for presentation to the national marathon champion in the austere days following the end of the Second World War. The engraved list of winners’ names commemorates the endeavours of generations of endurance runners. Glasgow’s Donald McNab Robertson leads the line. The Maryhill Harrier was the first winner in 1946. An Olympian in 1936 and six times AAA marathon champion, Robertson won the Scottish title again in 1947; but his life was cut tragically short two years later. He died of a thrombosis at the age of 43. Time marched on. Other names emerged and the championship developed its own history and generated its own statistics, its own trivia. Joe McGhee became the first man to win the title three times in a row, between 1954 and 1956. His 1956 winning margin of 13 minutes 22 seconds was the biggest until Simon Pride’s margin of 14 minutes 32 seconds in 2000. Fraser Clyne emulated McGhee’s feat of winning three in a row en route to a total of five championship victories in five attempts between 1991 and 1999. Alastair Wood established himself as the most prolific champion with six wins between 1962 and 1972. John Emmet Farrell could claim to be the unluckiest competitor. He won five medals between 1946 and 1954 but never collected the gold. Colin Youngson won a record ten medals in thirteen championship appearances between 1972 and 1985 – three gold, three silver and four bronze. English runners occupied the top three places in 1990 – the first occasion ‘foreigners’ achieved this feat. London-born Jack Paterson (Polytechnic Harriers) recorded the slowest-ever winning time – 2.57.07 – when winning the 1949 championship over a route between Gourock and Ibrox Stadium in Glasgow. It was a very hot day. And so the statistical tales go on. Donald Macgregor won three gold medals and six silvers – accumulated over a remarkable period of 21 years (1965-86). Jim Alder’s three second victory over Macgregor in 1970 is the narrowest winning margin so far. And Macgregor’s time that day – 2.17.14 – was the quickest non-winning performance until the overseas invitees appeared in 1999. Jim Dingwall’s time of 2.16.05 in 1977 is the fastest ever in the championship by a Scot. 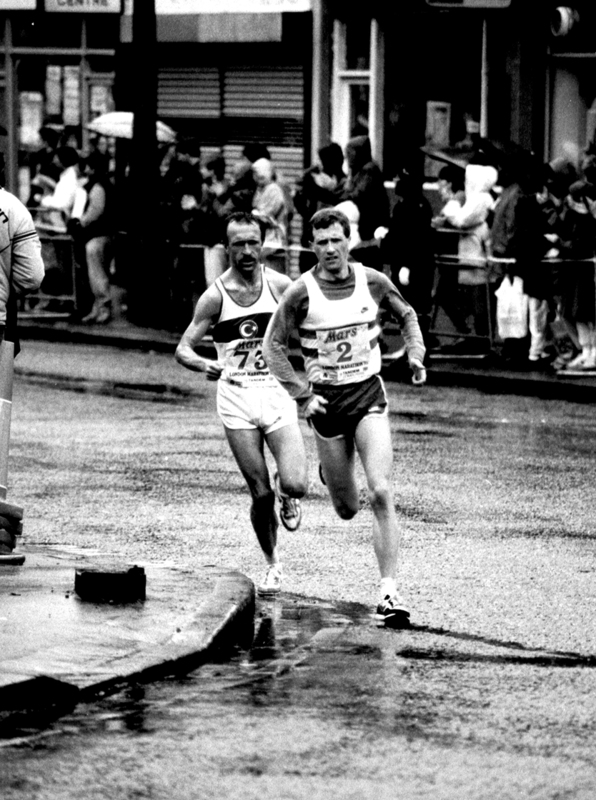 The two fastest Scottish Marathon runners of all-time – Allister Hutton and John Graham – have never competed in the championship. This last fact is not surprising. Hutton, Graham and other top Scots of the 1980s were often criticised for not taking part in the national championship. But the reasons were obvious. The carrots being offered elsewhere were decidedly more tasty. When Evan Cameron won the national title in 1984 he received a jar of instant coffee as a prize. Hutton and Graham, meanwhile, were able to command thousands of pounds in appearance fees plus many thousands more in prize money on the international circuit. The women’s championship is a much more recent addition. First held in 1983, it is still developing its traditions and history. Lynda Bain won the first two titles, and her time of 2.41.41 in 1984 was the championship best performance until Esther Kiplagat’s 2.33.09 in 1999. No woman has won more than two titles. Bain (1983 and 1984), Liz Hughes (1989 and 1990), Eileen Masson (1988 and 1991) and Eleanor Robinson (1993 and 1996) share the record for most wins. The biggest winning margin was in 1990 when Hughes finished more than 35 minutes ahead of her closest challenger; while the tightest finish came in 1987, when just 14 seconds separated Stephanie Quirk from Janine Robertson. The event, unfortunately, has failed to attract Scotland’s elite. Bain and Trudi Thomson are the only two of Scotland’s ten fastest women to have taken part in the championship. Like the men, it’s because of richer rewards on offer elsewhere. Although a Scottish championship was not held until 1946, many ‘marathons’ took place in Scotland during the first four decades of the 20th century. Many of these were of varying distances. The Edinburgh Exhibition marathon of 1908, for instance, was actually held over a distance of no more than 16 miles. The first recorded marathon in Scotland over the now traditional distance of 26 miles 385 yards was held in conjunction with the Powderhall New Year professional meeting. The 1909 Powderhall marathon, run from Falkirk to the Powderhall Grounds in Edinburgh, took place in bitterly cold conditions with snow and slush lying on the roads. Frenchman Henri St Yves won but contemporary reports do not confirm the racing distance, stating only that ‘it was over a distance of some 26 miles’. The following year the marathon was certainly held over the full distance, but on this occasion the whole race was run round the Powderhall track – for 105 laps. Englishman Jack Price won in 2.40.07, with Lochgelly miner Frank Clark runner-up just 46.5 seconds behind. The first official amateur marathon, held over a course between Fyvie Castle and Aberdeen, didn’t take place until April 1923. 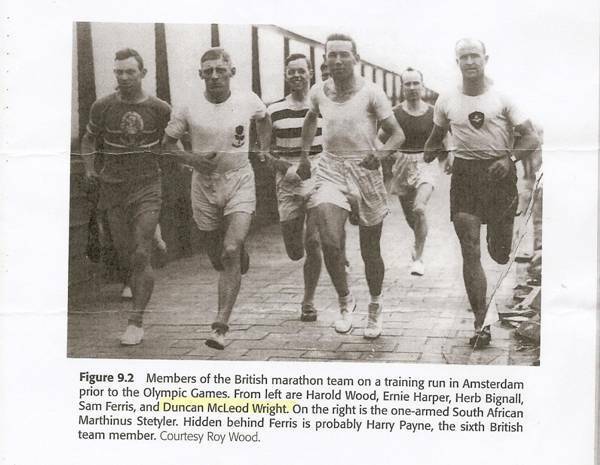 The decision to hold the race was inspired by the hope that it might, according to one contemporary newspaper account ‘reveal obscure talent capable of representing Great Britain at the following year’s Olympic Games in Paris’. The talent it did reveal was that of Clydesdale Harrier Dunky Wright who would, 23 years later, take part in the inaugural Scottish Marathon Championship. Wright made his marathon debut in the Aberdeenshire race – and won by the narrowest of margins. The experienced cross-country champion held a big lead at 20 miles but then hit the wall and was almost caught by local man Jim Ronaldson in the closing stages. Wright gouged out a victory in 3 hours 13 minutes 12.4 seconds, with Ronaldson just 37 seconds adrift. Dunky went on to take part in the 1924 Olympics but failed to finish. At the 1928 Games he took 20th place but went on two years later to hit the highspots by winning the inaugural Empire Games title in Canada. In 1932 he came close to Olympic Gold in Los Angeles but eventually had to settle for fourth place. Marathons have grabbed their fair share of attention in Scotland over the years since then. Perhaps the most notable performance in a domestic marathon occurred in 1966 when Alastair Wood set a European and Commonwealth best time of 2.13.45 when winning the Inverness to Forres race. The Association of Road Running Statisticians ranks Alastair’s time as fastest in the world that year. Wood also won the Shettleston marathon on a number of occasions during the 1960s. But it wasn’t until the early 1980s that marathon running became a mass participation sport in this country. When Mel Edwards organised the first Norco Aberdeen marathon in 1979 it attracted 77 competitors, 62 of whom completed the challenging four-lap course at Bridge of Don on the northern outskirts of the city. It was reported as the biggest marathon field ever assembled in Scotland. Then came the road running boom fuelled by the success of the inaugural London marathon in 1981. Races popped up everywhere. At one time during the mid 1980s there were 14 marathons in Scotland – at Aberdeen, Dundee, Glasgow, Edinburgh, Fort William, Loch Rannoch, Black Isle, Galloway, Easter Ross, Motherwell, Elgin, Dumfries, Greenock and even Benbecula. Benbecula once attracted just four participants. The following year there were 16 and the organisers claimed it was the fastest growing marathon in the world! Nowhere else could claim a 400% growth rate! Today, however, just a handful of marathons survive – and none of Scotland’s four cities holds such an event on a regular basis. (Actually, Edinburgh has reintroduced such a race.) The Glasgow marathon was the most successful. Bob Dalgleish got the event underway in the late 1970s but it was the 1982 race, sponsored by Scott’s Porage Oats and billed as the ‘Scottish People’s Marathon’ that really captured the headlines. An incredible 8242 folk entered and 5061 finished. The Glasgow Herald described the start of the race from Glasgow Cross as ‘one of the most amazing spectacles Scotland has ever seen’. The newspaper published a special 16-page souvenir pull-out the following day to mark the occasion. But Glasgow was to grow even bigger. In 1985 the event attracted an amazing entry of 20,062 – although there was a significant fall-out rate as ‘just’ 11,417 started and 10,928 completed the course. The expectations for continued growth were unrealistic and when the inevitable downturn in interest occurred the great race was killed off, to be replaced by what is now the Great Scottish Run – held over the half marathon distance. The final Glasgow marathon took place in 1987 when the Glasgow Herald reported that 5516 took part with 5300 finishing – more than the 1982 ‘amazing spectacle’ but not enough to ensure the future of the event.